Love, Reality Style by Judith Natelli McLaughlin is now available! New women’s fiction novel with a sharp wit, warm heart, and sweet tooth. 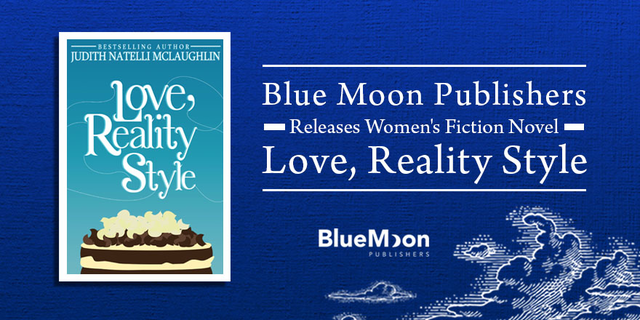 Bestselling author Judith Natelli McLaughlin writes in many genres, and we are thrilled to be celebrating the release of her second women’s fiction title, Love, Reality Style. This fun and quirky take on the romance genre is full of humour, and addresses real life questions head-on in a refreshingly honest fashion. We are sending big congratulations from the Blue Moon Publishers team! Love, Reality Style tells the story of cake-loving third-grade teacher Mary Grace Falcone, who receives a proposition of marriage from her germ-phobic boyfriend Ralph Ichy that throws her comfortable life into a tailspin. Should she marry Ralph? The man dubbed “the CEO of Antiseptic Hands”? Reluctantly, and despite the differing opinions of her best friends Jayde and Annie, Mary Grace accepts. Her decision gets her meddling mother off her back, but also lands her on a reality wedding show where handsome host, Nick Charmin, unexpectedly falls for her. Ultimately, Mary Grace must decide between hot Nick and faithful Ralph, and whether or not a slice of cake is really the answer to all of life’s problems. Love, Reality Style was inspired by Judith’s desire to write a straight-up romantic comedy. She thought a great setting for such a story would be a reality television show, so, after some brainstorming, the wedding show I Do was born. Since most of Judith’s writing is character driven, she decided it was time to come up with an eclectic cast, including cake-obsessed Mary Grace, germ-phobe Ralph, Annie of the failing marriage, snarky, successful Jayde, and overbearing, neurotic Angela. Love, Reality Style is being published by Blue Moon Publishers and is being marketed by DigiWriting, both firms based in Toronto, Canada. It is available on Amazon and at local New Jersey bookstores. Judith Natelli McLaughlin is an author/illustrator whose work crosses over many genres. Her novel, This Moment, appeared on the Amazon bestseller list. Her children’s poetry has been published alongside idols like Shel Silverstein, Jack Prelutsky, and Judith Viorst. Her children’s classic, Poems on Fruits and Odes to Veggies – Where Healthy Eating Starts with a Poem, is a staple in the world of healthy eating, making good food choices fun. Her middle grade novels include Dear Diary, E.P. Thompson Here, and the first in her chapter book series, Mackenzie Goode Makes a Mistake – A Big One, was published in 2015. She lives in the Garden State with her husband, Brian, three daughters, Katie, Lindsay, and Maggie, and a Westie named Duke. She is proud to call herself a New Jersey native.